← A very good year . . .
Mott MacDonald (Rail Project Specialists) have now completed both the GRIP1 and GRIP2 studies into the feasibilty of a railway station to serve Magor and Undy. These reports are the first 2 stages of an 8 stage Network Rail process. The second report, which follows the ‘output definition’, is a 120 page analysis that identifies if any options are feasible. We are pleased to say that the report indentifies 3 potential solutions (basically, platform positionings) that now need further investigation to narrow down to the best choice. This GRIP2 report has only just come through so there is much work to do in understanding the detail and will include further discussions with Mott MacDonald, Network Rail and Monmouthshire County Council. Our hope this year is to commission the 3rd and 4th stages (option selection and single option development). Please keep on supporting us and ‘liking’ what we are doing. We will publish both reports on our website (in the documents section) in the near future. Incidentally, we have just heard that railFuture (a national organisation) has kindly offered to help us fund the next stages. You can see their newsletter which contains some detail on this by clicking here. We reported recently that MAGOR had joined the fledgling ‘3 Fields Community Trust’. This trust has the aim of developing a community centre on the 3 Fields site. 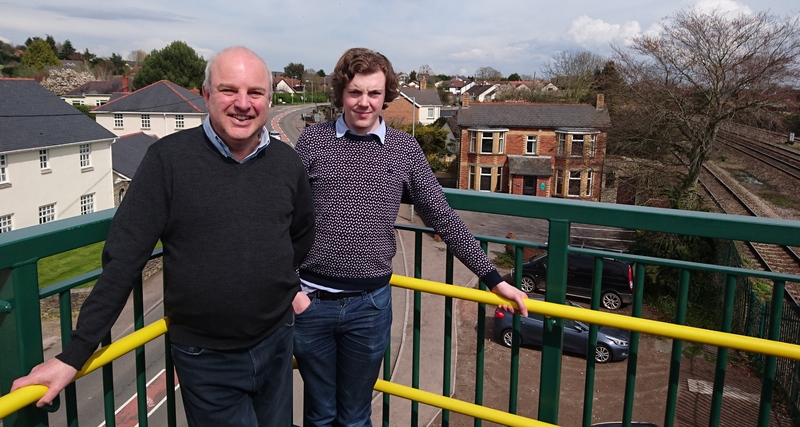 MAGOR is very keen to see the long overdue centre built but has an additional interest to see that the centre and the station complement each other. In addition to us, the trust currently has representation from Magor with Undy Community Council and South East Wales Energy Authority with other groups (e.g. Magor Churchmen, Magor Players and ARC) showing keen interest in joining. There have been a couple of meetings so far but recently Magor and Undy Community Council (at a special meeting) voted to return unused monies, from a large loan taken out in 2009 to build a community centre, back to Welsh Government (read more here). This was against the desire of the trust and does seem rather strange timing when a new delivery group (the trust) is just forming. Nevertheless, MAGOR is hopeful that the trust will become fully established, gain the support of the local population and find new ways to fund the centre. The uniqueness of the Magor and Undy Walkway Station is gaining interest further afield. We are very happy that the Unviversity of West of England recently contacted us and asked if one of their graduates could use MAGOR as part of his studies. So earlier this week Ted and I met David Johnson (a lecturer) and Chris Waller (the student) to discuss some specific topic areas. 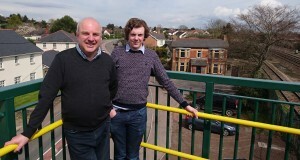 The picture shows David and Chris on the new footbridge by the site of the old Undy Halt. Further details of Chris’s input to the ‘Magor and Undy Project’ will appear here in due course. Finally, don’t forget our next meeting is on 21st April (Golden Lion) and we will also be at the May Fayre on May 2nd. 2 Responses to We have another GRIP too . . . . Given the ridiculous parking issues in and around Magor, specifically near the school has the need for adequate parking for both a station and a community center been taken into account in plans for a new station. If the current car park on this site is all that is being planned, cars will be pushed to the surrounding areas. Given the locals inability to understand the law concerning parking on streets and their total lack of respect for other road users I envisage Magor turning into 1 large grid locked hell hole. You raise a valid point and it is one that has been recognised early on by the group and discussed with another concerned resident at our meeting of 21st January (see minutes section). I agree that some Magor residents do seem very attached to their cars, use them for the shortest journeys and park inconsiderately and it certainly is a risk that will need to be mitigated against if the ‘Walkway’ concept is to work. As the technical solution (location of the 2 platforms) is narrowed down to the preferred locations, the next stages of the GRIP process will address this in detail. It would be a great shame if the probability of a station was jeopardised because people couldn’t get out of the ‘car everywhere’ mind-set. Of course there will need to be disabled parking, ‘motorbility scooter’ spaces, cycle racks, a good ‘drop off’ point and some limited parking but other methods will be need to ‘encourage’ people to use the station as planned. If people still need to use a car (and there can be good reasons e.g. heavy luggage) then they would be encouraged to use Severn Tunnel Junction in such instances. If we are to reap the benefits of a local station, we will need to think hard how to remove such obstacles.